Politeknik comprises three companies that respectively manufacture flexible metal hoses, electro filters, and thin-walled multi-ply and customised expansion joints. More than 30,000 expansion joints are manufactured annually, with 50% exported. Industries we serve include power, geothermal, chemical, marine, steel, cement, and construction. We can manufacture bellows from various grades of 300 series stainless steels such as 321ss, 304ss, 316ss, 309S, 310S, or other materials such as 904l, Inconel 625, Duplex 2205, Duplex 2507, Monel 400, Incoloy 825. U-shape bellows are designed and manufactured in accordance with the latest EJMA standards. Lens (flanged and welded) type expansion joints are designed and manufactured in accordance with industry standards and our decades of experience. Politeknik has a wide range of standard expansion joints for 6barg, 10barg and 16barg. Weld End Type standard versions come with carbon steel weld ends. For weld ends, we can use stainless steel or other materials per your request. Fixed Flanged Type standard versions come with PN6, PN10, PN16 carbon steel flanges. We can use other types of flanges in accordance with ASME, AWWA or JIS norms or special flanges according to specifications. Materials can vary based on customer request. Floating Flanged Type standard versions come with PN6, PN10, PN16 galvanised carbon steel flanges. As in fixed flange type, other drilling and material choices are available. Externally Pressurised Type with fixed, floating flanges or weld ends are generally used when axial movements and pressure are high. In this type of expansion joint, bellows is protected from external damage by an outer casing and inner casing protects bellows from damage due to flow. They are very robust and safe. Central Heating System Types are used frequently in high building installation columns in central heating systems. Standard axial movement capacity is 50mm and design pressure is 16barg. Rubber Expansion Joints are used to absorb axial, lateral, angular movements in low capacities and vibrations. They can be used up to 110°C with 16barg. Bellows element may be manufactured from EPDM, NBR, or Neoprene. They come with galvanised carbon steel flanges with PN16 drilling. Fabric Expansion Joints consist of textile-based material layers in various properties selected according to the type of medium and temperature. Pressure resistance is low but temperature resistance can reach up to 850ºC. Vibration Absorbing Metal Expansion Joints are designed for absorbing vibrations in pipelines or equipment. They are manufactured from multi ply bellows to dampen vibrations and for increased cycle life. Standard parts come with floating flanges and limit rods. Exhaust Expansion Joints are used on exhaust pipes of the main and auxiliary marine engines, generators and big engines. Since these joints are usually exposed to high levels of vibration, they are designed as multilayered bellows. We specialise in custom-designed expansion joints such as tied universal, gimbal, hinged, pressure balanced. They are designed according to your needs. Pressure Balanced Expansion Joints are used where axial movements are present and pressure thrust needs to be restrained continuously. They can also be used where nozzle loads need to be minimum. Hinged Expansion Joints are designed for absorbing angular movements occurring in only one plane via hinges and pins while restraining pressure force of the bellows. Hinged expansion joints should be used in sets of two or three to function properly. Gimbal Expansion Joints are designed to absorb angular movements occurring in any plane via hinges or the rotary rings while restraining pressure force of the bellows. Gimbal or hinged expansion joints can be useful if external anchoring is not possible. Tied Universal Expansion Joints comprise two bellows connected with an intermediate pipe. They are designed to absorb lateral movements and/or angular movements in a single plane, while continuously restraining bellows pressure force. Politeknik is your reliable partner in expansion joints. Custom solutions to complex problems are Politeknik’s specialty since 1976. We are selected by customers worldwide for our high-quality, flexibility, responsiveness, short delivery times and experience. 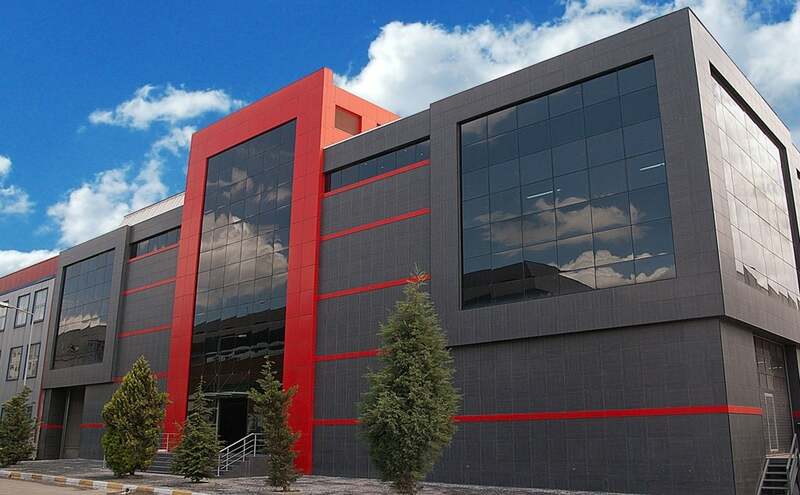 In 2013, Politeknik Group moved to its new location in Tuzla Free Trade Zone, Istanbul, Turkey. Our new location spans 12,000m², where we manufacture an extensive range of metal expansion joints and flexible metal hoses. Politeknik manufactures several jacketed expansion joints for a chemical factory. Politeknik has supplied four large diameter high-pressure expansion joints to a critical gas line for a customer in Turkey.